The 1960 national collegiate basketball champions from Ohio State. I hope that this weekend and on Monday night, Oden, Conley, Lewis, and others will prove to be successors Lucas, Havlicek, Siegfried, and all in every way, bringing the 2007 championship to Columbus. Click here. Then click on TV Spots and then, Cross Walk. The realism achieved by game developers like those with PlayStation on MLB 07: The Show amazes me. I don't own a system and wouldn't have the time to get caught up in the whole business anyway. But I am impressed. Here in the real world, I've always considered this to be the best time of year, college basketball's March Madness reaches its climax and baseball season, with the promise of a World Series for my favorite team, hit at the same time. How great is that? I've written before about "Jesus Rising from the Swamp," an oversized and kitschy representation of Jesus that amuses or embarrasses motorists driving north on I-75 between Cincinnati and Dayton. 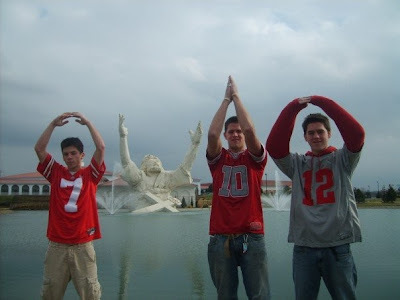 As The Ohio State University men's basketball team prepares to play Georgetown in the Final Four, it's good to know that the Swamp Statue is rooting for the Buckeyes! Dr. Helen Smith, a forensic psychologist, blogs about a study that says women are angrier than men and often express it in passive-aggressive ways. My wife, who feels no hesitation about expressing anger in helpful ways, is a healthier, happier, and less angry person than many women--not to mention than most men, including me--because she doesn't feel the need to artificially bottle up her feelings. And she often laments the conditions the study identifies: that women are angry and that it's probably because they express their anger in passive-aggressive ways. Both she and my daughter are such open people. They get disgusted with women in the workplace who resort to passive-aggression and behind-the-back torpedoing, usually of other women, especially those in positions of authority. Why is this so prevalent? Historically, our culture has put men in places of authority, whether at home, in the workplace, or in social settings. Women have basically been told to get with the male-set program. This incites understandable, justifiable anger within women with no productive ways to express it. I don't subscribe to the "tea kettle" school of thought that tells us if we don't immediately vent our spleens, we'll implode. Venting everything we feel can be narcissistic and imprison us and our relationships to our fleeting feelings. There is more to us as human beings than our emotions. Or our thoughts. Or our biology. But I do think that relationships in all contexts would be healthier if so many women didn't feel constrained to live in the manner described by the study. The Bible has an interesting passage which I share with people--female or male--when they're thrashing over how to deal with a confrontation they need to have: "Be angry; but do not sin. Do not let the sun go down on your anger." The point: It isn't "bad," as I think many women are taught, to feel anger. The question is what to do with our anger. Do we use it to discuss things with the object of our anger, with the goal of finding a commonly-acceptable solution and of repairing the relationship? Or do we allow it to live inside of us and make us hateful toward the other person, often expressing the anger and now the hatred, in passive-aggressive ways? That passage from Ephesians, then, commends taking ownership of our feelings and finding productive, healthy ways to deal with them. In other words, we don't allow our feelings to micromanage our psyches and lives, programming us. The most hate-filled person I know is an angry passive-aggressive woman who, when confronted with how hurtful her words are, claims that she's being misunderstood and implies that people who think otherwise must either be having bad days or losing their minds, literally. (More passive-aggressiveness.) This woman may even believe it when she makes these claims. But her family will tell you that her approach is very destructive to her, to their family, and to everybody's health. just be quiet! Then maybe he could read these posts. The blogging world can sometimes be ugly, as this post reminds us. Maryland legislators and evidently, its governor, are tired of seeing their state overlooked in presidential election years. They say that their ten electoral votes make them less important in electing Presidents than large states like California and New York or perennial swing states like Ohio and Florida. But Maryland's legislature and governor appear poised to approve a plan which, in spite of their intentions, will, if adopted by other states, likely give their state even less say in who becomes President than they have now. The proposal is being pushed nationally by an organization concerned that under the Constitution and its establishment of the electoral college, four presidential elections in all of US history have produced presidents who didn't receive popular vote majorities or pluralities. They want to have a popularly elected President, but daunted by the process involved in amending the Constitution, they've floated a bizarre proposal that's contained on the Maryland legislation. The bill, which the [State] Senate approved 29 to 17 yesterday, would award the state's 10 electoral votes to the presidential candidate who wins the most votes nationwide -- not statewide. It's easy to see a huge problem with this proposal right off the bat. Let's say that in 2008, Maryland voters cast 65% of their ballots for Hillary Clinton, the presumptive Democratic nominee. But assume that the overall national vote total is closer: Rudy Giuliani beats Clinton by a whisker, 50.1% to 49.9%. Wouldn't Maryland voters, who made their sentiments overwhelmingly known, feel disenfranchised when they see their state's electoral votes give the win to Rudy? Sen. Michael G. Lenett (D-Montgomery) ...said the system proposed could just switch the target for candidates from closely divided states to large cities with many voters -- a scenario that would not necessarily empower Maryland. Lennett is right. Under the Maryland bill, which wouldn't go into effect until states with a collective majority--270 votes--in the Electoral College adopted the same system, Presidential campaigns would likely be focused on vote-rich metropolitan areas only: New York, Los Angeles, Chicago, Philadelphia, Houston, Atlanta, and a handful of other places. Lost in the shuffle would be rural, small town, and suburban areas of all sorts. Contrary to causing states like Maryland to have less importance in choosing our Presidents, the Electoral College makes it possible for it and other states more say in the process than they would in a process decided solely on the basis of the popular vote. Maryland isn't ignored because its Electoral College delegation is paltry. The state's ten votes equal those of Wisconsin, Minnesota, and Arizona. It has more votes than Maine, New Hampshire, Vermont, Connecticut, Rhode Island, Delaware, West Virginia, South Carolina, Alabama, Mississippi, Lousiana, Arkansas, Kentucky, Iowa, Kansas, Oklahoma, Nebraska, North Dakota, South Dakota, Montana, Wyoming, Colorado, New Mexico, Utah, Nevada, Idaho, Oregon, Alaska, Hawaii, and the District of Columbia. Only eighteen states have more electoral votes than Maryland! The real reason a state like Maryland might get ignored by presidential nominees is its predictability, not the size of its Electoral College delegation! The state's perennial habit of voting for Democrats for President means that Republicans skip the state and Democrats take it for granted. Lest Marylanders view this assertion skeptically, consider California. Presumably, if the Republicans nominate Giuliani in 2008, that state would be in play for his party for the first time in many a presidential election cycle. In recent years, California has been regarded as being so likely to go for the Democratic candidate that Republicans have made little effort to win over voters there. This, in a state with 55 electoral votes, 20.3% of the total needed to get elected President! Predictability prevents Republicans from pitching their appeals to Californians and causes Democrats to take it for granted. If that's true for California, you can bet it's true for Maryland. Proposals for converting to the popular election of Presidents may have merit. But since 1789, the Electoral College has been a hedge against disregarding the interests and concerns of smaller states (and communities). Before Maryland and other states throw away the College, they might want to consider what else they might be throwing away! Most weeks, I present as many updates on my reflections and study of the Biblical texts on which our weekend worship celebrations will be built as I can. The purpose is to help the people of the congregation I serve as pastor, Friendship Lutheran Church of Amelia, Ohio, get ready for worship. Hopefully, it's helpful to others as well, since our Bible lesson is usually one from the weekly lectionary, variations of which are used in most of the churches of the world. However, I won't be presenting the passes over the next several weeks. They'll resume during the week of April 15. The New Testament portion of the Bible, both in its accounts of Jesus’ earthly ministry and in the letters written by some of His earliest followers, shows us that women have always been more open than men to Christ’s call to repentance and new life through faith in Him. This may partly be because in the cultures in which Christian faith first took hold, women occupied an inferior status. They didn’t suffer from the control freak hangups that so often prevent men from pursuing a life of faith. But more importantly, through Christ, women saw that in God’s eyes, men and women, both made in God’s image, are equal. In recent years though, I’ve met a number of married couples in which the traditional pattern has been reversed: the man has wanted a connection to Christ and the church, while the woman resists it. Whichever spouse disdains church involvement, it’s hard for the other spouse. 1. Don’t let the objecting spouse keep you from being involved in a church. If you believe that the church is important for your spiritual well-being and growth--and I obviously believe that’s true, you should forge ahead with church involvement. Make it clear that weekly worship and pursuing your own personal area of Christian service are priorities in your life. 2. Don’t criticize your spouse when she or he refuses to go to worship or church functions with you. No one has ever been successfully harried or insulted into faith in Christ or church involvement. 3. Pray for your spouse. Ask God to open their will and heart to the possibility of church involvement. 4. Enlist the prayer support of Christian friends. Ask them to ask God to help you to maintain a strong connection with the church and to pray for that openness in your spouse I mentioned above. I can’t guarantee that resistant spouses will join you in worship if you follow these steps. But I can guarantee that if you don’t follow them, they won’t be involved and it’s possible that you’ll lose your motivation, too. Don’t let anything keep you from being connected to Christ and His church! Labels: why should I go to church? [Today, a memorial celebration of the life of Eileen Murphy, the principal of Summerside Elementary School in our community was held. More than one-thousand people were in attendance, filling the Performing Arts Center of Glen Este High School. She was a beloved figure and the 600-children and staff of Summerside were just some of the people wrestling with the suicide of a beloved educator. Many more who are part of our West Clermont Local School District have been affected by this loss. I’m not sure there is an answer to that question. More than that, I’m not sure that having an answer would help us very much. How do you--how do we all--proceed with the living of our lives knowing that there are things that happen in this life that are so big and so sad and so horrible that we can’t explain them? How do we live knowing that life is good, but life isn’t fair and life doesn't always make sense? Just a few thoughts. First, and this is especially for the boys and girls: Listen to each other. Be kind to each other. Treat each other with respect. When we know that even this beautiful world full of wonders and laughter can be infected by sad things, we should all make it our goal to treat others with the same kindness and love with which we want them to treat us. Second, boys and girls, when you have feelings of sadness or anger inside of you, tell a trusted grown-up like a parent, a teacher, a counselor, a pastor, or, for some of you, a Boys and Girls Club adult. When I was a little boy and I got frightened or sad, those bad feelings always got worse if I kept them to myself. But when I told my parents, grandparents, or some other grown-up I trusted, those feelings got smaller or went away. A trusted grown-up can help that happen for you too. And grown-ups, we never grow too old for this advice! Third: The sixty-something year old woman who, when I was in my early twenties, helped me move from being an atheist to a believer in God used to tell me whenever something was bothering me, “You know, Mark, it’s not something you can’t pray about.” You can talk with God about anything! You can even tell Him when you’re angry with Him. The Bible tells us to cast all our cares on God because He cares for us. He cares for you. So, talk to God. Pray. Fourth: Live in the assurance that your life matters to God. Every single second of it! In the New Testament portion of the Bible, you can read the letters of a man named Paul. Once a hardboiled enemy of Christian faith, he became a follower of Christ and suffered beatings, imprisonment, shipwrecks, and all sorts of abuse because of his faith. He had every reason to ask, “Why?” But Paul kept following Christ. He did this because he remembered, as many of us will do in just a few days, that Christ gave up His life on Good Friday and then rose to give new life to all who believe in Him on Easter Sunday. What then are we to say about these things? If God is for us, who is against us? He who did not withhold his own Son, but gave him up for all of us, will he not with him also give us everything else? Who will bring any charge against God’s elect? It is God who justifies. Who is to condemn? It is Christ Jesus, who died, yes, who was raised, who is at the right hand of God, who indeed intercedes for us. Who will separate us from the love of Christ? Will hardship, or distress, or persecution, or famine, or nakedness, or peril, or sword?...No, in all these things we are more than conquerors through him who loved us. For I am convinced that neither death, nor life, nor angels, nor rulers, nor things present, nor things to come, nor powers, nor height, nor depth, nor anything else in all creation, will be able to separate us from the love of God in Christ Jesus our Lord. As you face a loss so big and so sad and so horrible that you can’t explain it, I hope you’ll remember that God is bigger than all our hurts and that today and every day, His arms are opened wide to you. Less than a week before He will be crucified, Jesus is at dinner in the Bethany home of Mary, Martha, and Lazarus. Just a short time before, Jesus had raised Lazarus from the dead. It was this incident, proving Jesus’ dominion over death, that caused His enemies to hatch their conspiracy to kill Him. They couldn’t stand the thought of losing control of Israel’s religious life to this Savior of wildly unpredictable love and grace. During the dinner, Mary of Bethany does something strange and extravagant. She breaks open an ointment imported from India, the cost of which is the equivalent of a year’s worth of wages. She pours the ointment on Jesus’ feet. In one way, the gesture is like that of a servant, similar to what Jesus Himself would do on the night of His arrest when He washed the feet of His disciples. In yet another way, Mary’s action is like that of a family member anointing a body for burial, the only other time it was deemed appropriate to touch another person’s feet. Mary seems to sense that in heading for Jerusalem to celebrate the Passover, Jesus is also heading toward certain death.John says the aroma filled the place. What a contrast it would have been to the stench of death that had, just a short time before, filled the tomb in which the body of her brother, Lazarus, had been lain days before Jesus called him back to life. Of course, within days, Judas will betray Jesus for one-tenth of the value of Mary’s nard! Like many religious traditionalists, Judas has a dark core of sin he tries to hide by pointing to the faults, real and imagined, of others. He wants to make everybody as miserable as he is by demanding that they conform to his ideas of religious propriety. When his darkness is bared for the world to see a few days later, Judas' religiosity keeps him from having faith in a gracious God Who forgives and so, embarrassed, he takes his own life. At the dinner in Bethany, Jesus tells Judas to back off: Mary, He says, is only honoring Him and preparing His body for burial when she could. David Stark, director of a ministry at Prince of Peace Lutheran Church in Burnsville, Minnesota, identifies four ways in which faith, represented by Mary of Bethany, is contrasted with religion, represented by Judas, in this incident. I think that Stark is absolutely on the money here and I want to share these four contrasts between faith and religion with you. This congregation isn’t everybody’s cup of tea. I believe that one reason for that is that some people walk through our doors looking for religion, a set of rituals and time-worn habits. But other people come here looking for Jesus, looking for a faith relationship with the Savior-God Who died and rose for us. People see Jesus through our imperfections and our surrender to Him in ways they never could if we were a smells-and-bells outfit. There's nothing wrong with a smells-and-bells approach to worship, as long as it's done out of a genuine faith in Jesus Christ. But such an approach is a hollow show if it's just a weekly religious exercise! If we were into religion, our building and worship practices would be to Judas’ liking; since we’re into a living faith relationship with Christ, I think that we’re more like Mary of Bethany! David Stark also says that in our lesson, we see that religion never breaks out of old boundaries and rules, but faith does extravagant things because of its love for Jesus. Mary did what Judas could never imagine doing. Faith gives away more love and devotion than it can really afford! Shortly after Easter, we’ll be convening a four-session class called ‘Witnesses for Christ.’ This is the most important thing we have ever done at Friendship. The Church Council hopes that every adult and junior and senior high member of Friendship will participate. “I don’t have the time,” you might say. Especially when there will also be some outside reading and assignments. Maybe you don’t have the time. Spend it anyway. Be extravagant. Spend time you don’t have and effort you can’t afford in order to become a more joyful, confident witness for the Savior Who died and rose for you! Our Bible lesson also shows us that religion loves ruts of standards and habits; but faith jumps at the unexpected chances to live for Christ that everyday life brings. When Mary awoke on the day on which our lesson takes place, she may have had no idea that Jesus would show up. After all, there were no telephones, no email. She probably had no intention of breaking open the container of expensive ointment. Once she broke the glass of the sealed bottle, she would have to use every drop of the ointment; there was no way to re-seal it. Yet, she did break it open. She did so because Jesus was there in her home at a particular moment, a moment that would pass and then be gone. His death seemed imminent to her. She did for Him what she could while she could! Faith is always on the lookout for ways to demonstrate the love of Christ when it can. I’ve told the story before of what happened when evangelist and social activist Tony Campolo went to Hawaii for a seminar. One evening before a presentation, he and a colleague walked into a diner that turned out to be the gathering place of prostitutes before and after they went out onto the streets. Campolo began to engage these women in conversation. When it was clear that he wasn’t interested in buying what they were selling, they asked questions about him and his work. He explained that he was a Christian and a pastor. As they talked, Campolo learned that it was the birthday of one of the prostitutes. No one would send her a card or give her a cake and she would spend the evening in her humiliating trade. Campolo found out that this woman and the other prostitutes all would return to the diner at 3:00 in the morning. So, he and his friend went to a bakery to buy a cake. They bought streamers and hung them in the diner. When the prostitutes returned, they were stunned, especially the one whose birthday it was. "What kind of Christians are you?" she asked. Campolo answered: “The kind of God Who throws birthday parties for prostitutes at 3:00 in the morning.” What extravagant expression of Christ’s love will you allow your faith to manifest this week? The fourth thing our lesson shows us is that religion always looks to others with criticism and judgment; faith moves toward others with love. Mary responded to Jesus’ love with an act of outrageous devotion. Judas condemned her for not looking and acting like all the other good folks down at Jerusalem Lutheran Church. As some of your know, our daughter Sarah called me from Florida the other night. She was excited. "I was witnessing for Christ with a co-worker," she told me. This co-worker, who’s coarse and difficult and sometimes whiny, had turned a lot of people off. Sarah decided to try to befriend her. Here, Sarah’s story dovetails a bit with that of Tony Campolo. She learned that her co-worker’s birthday was the next day. So, before heading for work, Sarah went to the closest grocery story and bought a big birthday cake, along with some candles. It was an unnecessary thing for her to do, extravagant given the small income she and her husband are now bringing in. But it made Sarah feel good. It always feels good to follow faith’s call to move to others with love. Mary had faith. Judas had religion. Mary turned her heart toward Christ; Judas was worried whether others thought he looked religious. Mary moved outside the boundaries of propriety to love Christ; Judas kept his religion within rigid lines. Mary jumped at unexpected chances to live her faith; Judas wanted everything to be done according to some traditional form. Mary moved out in love; Judas lashed out in judgment. Which will it be for you: religion or faith in Jesus Christ?